[mrgreen] This dreamy machine will captivate many slot players. Bally, a longtime maker of various gaming and amusement devices, made this lovely video slot machine. How Many Reels and Pay Lines Does this Machine Offer? Many video slot machines spin five reels. Moon Goddess is no exception. This title also delivers 30 pay lines that are active on every spin. Anytime the player lands three or more of the same symbol from the above list on the same pay line, the machine will award a prize. Moon Goddess also offers other, wilder symbols. Does this Title Offer any Special Features? This slot machine includes a “wild” symbol that sometimes stretches to cover an entire reel. Such an “extended wild” gives the player additional chances to win when it appears. In Moon Goddess, the wild symbol can substitute for any other symbol and help the player win prizes. Moon Goddess also includes a “scatter” symbol with an image of the moon on it. When three moon symbols appear scattered across this game’s reels, the player receives free spins. This feature gives the player the chance to spin the game’s reels without placing an additional wager. A free chance at winning credits is very valuable to any person who routinely plays slot machines. What Is the Highest Prize a Player Can Win on this Machine? 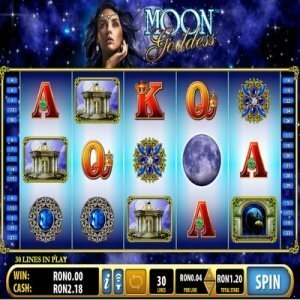 Moon Goddess offers a top win of 10,000 credits. That is no shabby win! To win 10,000 credits, the play must land five Earth-and-moon symbols on the same pay line. As one might imagine, this outcome is an infrequent occurrence. Moon Goddess draws upon ancient mythology and worship of the moon. One does not have to believe in astrology to enjoy this game. With its smooth game action and sharp imagery, this video slot machine delivers fun and excitement.